On November 26, Chinese and Western media reported the first flight operation on board of China's brandnew aircraft carrier "Liaoning". That event was troubled by the sudden death of the responsible commander of seaborne fighter jets, Luo Yang, who had died the day before from a heart attack at the age of 51. 26 dual-engine Chinese fighter jets Qian-15 ( also known as C-15 or Shenyang J-15 and purportedly comparable to U.S. F-18 jets). 20 helicopters equipped for anti-submarine combat. 4 helicopters used as an early-warning system. According to Western sources, the "Liaoning" will not be fully operational before 2013. While that carrier has been constructed on the hull of an abandoned Soviet carrier, the "Varyag", same Western sources are saying that another Chinese aircraft carrier should already be in construction, being entirely built on Chinese parts. 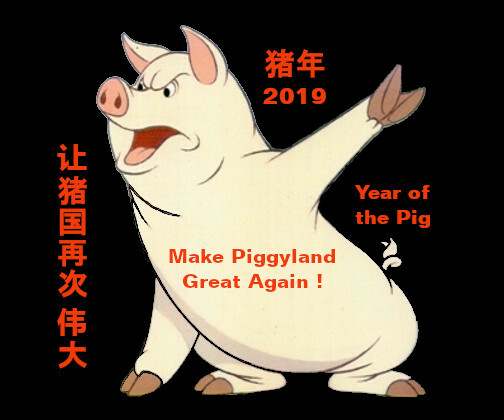 Further information can be found on another blogspot of mine dealing with the inauguration of China's first aircraft carrier. 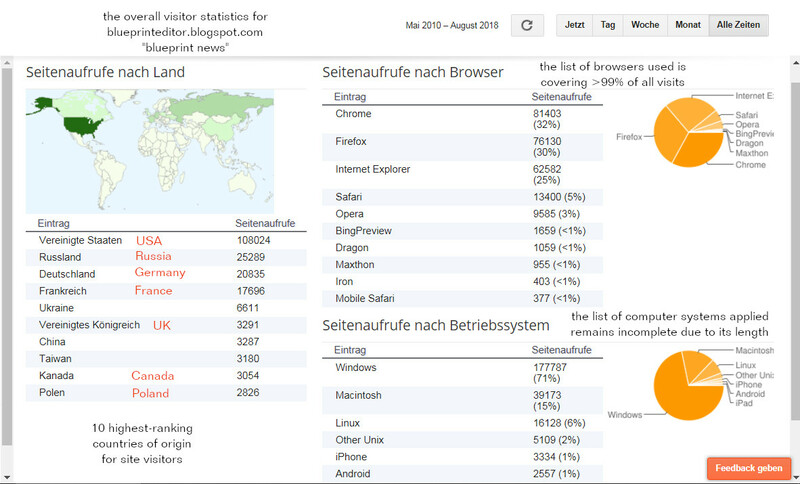 the Distribution of Visitors to "Blueprint News"
While dealing with the daily visitor statistics of "blueprint news", I noticed that some of my recent blogspots brought about lots of additional visitors. These visitors referred to such news items dealing with a probable war on Iran, the proceedings of Egypt's president Morsy and the current Ghaza conflict. All those subjects are interrelated within a wider frame that comprises relations between Israel, Palestine and Egypt as well as some kind of ubiquitous Islamic resistance against a U.S.-Israeli alliance that is allegedly threatening the world of Islam in general and the Islamic Republic of Iran as well as the people of Palestine in detail. Please note: The maps on this site are showing visitor access points that can be activated by one or more visitors according to their individual specifications. There are general access points for a certain country / region or specific access points enabling the identification of a single visitor. Visitors using address tags like ".com" or ".net" instead of country tags cannot be detected. All local visitor signs are referring to the last 200 registered visitors. Visits dating back more than two weeks have not been included. The photos are showing Israeli shelling of Ghaza City (right) and ruins left by Syrian government shelling of civil targets. Israel's war against Ghaza came as a sad surprise for Syrians. In more than 1500 air raids, Israel killed 160 Palestinians corresponding to 817 Syrians killed by the [Syrian] regime. Latest UPDATE for November 17 / 18 further down ! Ghaza: Israeli shelling continues while rocket hits near Jerusalem. After a new type of rockets hit areas of Israel, up to now considered to be secure, Israel is planning an offensive against Palestinian Hamas insurgents in Ghaza. 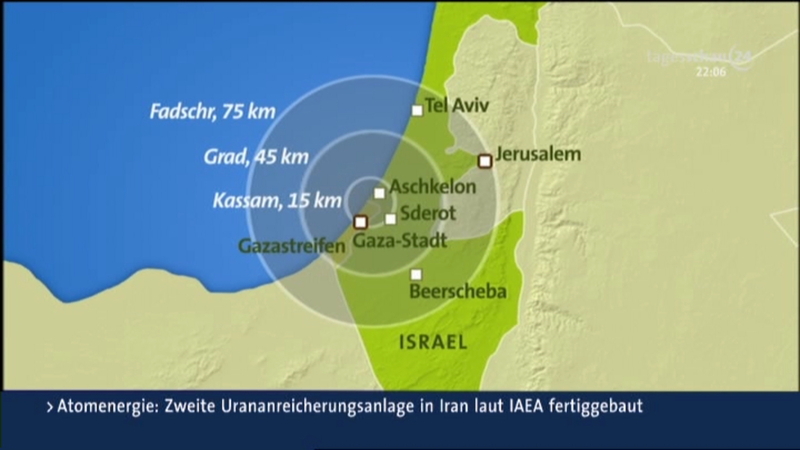 Above: Range of rockets used by the Hamas movement to attack Jerusalem and Tel Aviv from the Ghaza strip. The Iranian Fajr فجر 5 missile has given a new dimension to the long-standing war between Palestinian insurgents and Israel. Such missiles have been smuggled from Egypt into Ghaza via the demilitarized zone neighbouring Ghaza. Much support from Egypt should not be expected by Israel when it comes to stop smuggling weapons into Ghaza as president and prime minister of Egypt have already shown their sympathy for the Hamas movement. That should be clear, at least, after Egypt's PM Hisham Kandil visited Ghaza for some hours today. 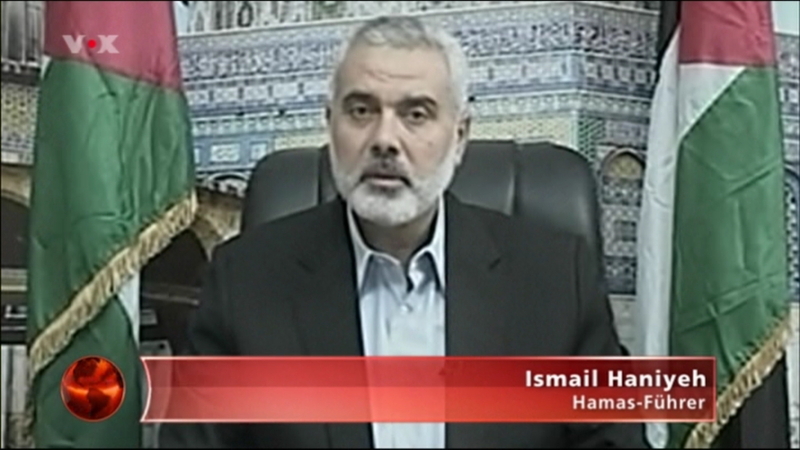 Above: Egyptian PM Hisham Kandil (left) meeting with Hamas leader Ismail Haniyeh (right). The Hamas movement announced to deal with "several proposals from different states" [for] a conclusion [giving priority to] an appeasement with Israel [while] making it clear that "there is no [advantage until the moment] Israel is ending its attacks on Palestinians in the Ghaza sector." On Friday, the Israeli army said it decided to close three passages near the Ghaza sector for [public] traffic of [Ghaza] city [thus giving] another hint on possible concentration of desert troops in the environment facing the [Ghaza] sector. 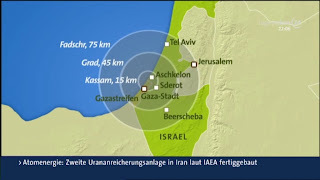 A million Israelis need to seek shelter against rockets from Ghaza. Many martyrs [or: dead war heroes] and wounded in Ghaza [while] the resistance is responding with shelling the "implanted colonies". Editor's Note: The expression "implanted colonies" has the full meaning of "implanted colonies in occupied territories" and should therefore refer to any Jewish settlements. The Iranian website in Arabic language (cropped image below) is mentioning a death toll of 31 Palestinians and 450 wounded in recent fightings. 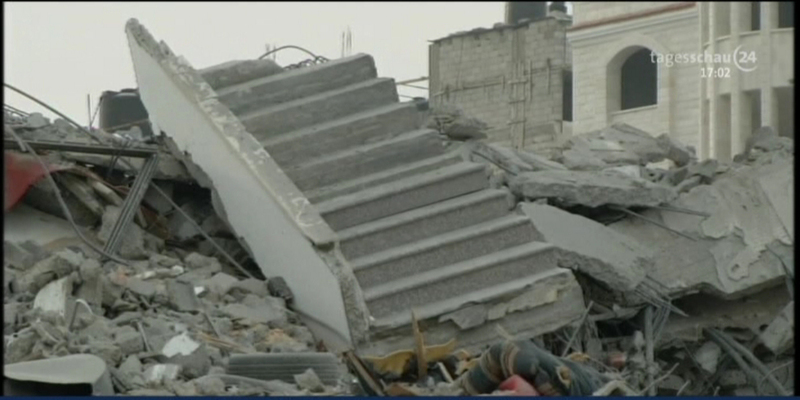 On November 17, the center of the Hamas movement in Ghaza has been destroyed by Israeli troops. Two days before (Nov. 15) the PLO Delegation in Washington DC published a comment at the beginning of renewed military action against the Ghaza strip, staged by Israel and formally approved by the Obama administration. In the below snapshot of that comment, the address of the original PDF document has been inserted to enable verification. The al-Qassam Brigades said they launched rockets able to reach Tel Aviv and Jerusalem. According to Al-Jazeera's reporter there should have been three wounded during Israeli shelling of a building that is hosting [news agencies] in the Ghaza strip. Editor's Note: The Izz ad-Din al-Qassam Brigades, Hamas's military wing formed in 1992, is named in commemoration of influential Palestinian nationalist Sheikh Izz ad-Din al-Qassam. Although the al-Qassam Brigades are an integral part of Hamas, they also operate independently of Hamas, and at times contrary to Hamas' stated aims. Short-range rockets they use are, as well, named Qassam rockets, even though they might be almost identical to the rather primitive Katyusha missiles used by Hezbollah insurgents in Lebanon. Above: Ghazi Hamad, deputy foreign minister of the Hamas government for Ghaza, in an interview with the English service of Al-Jazeera. At least 55 people in Ghaza killed by Israeli air strikes and hundreds wounded. Israeli army says 50 rockets have been fired from the Ghaza strip on Sunday. Israeli army says 33 rockets have landed in Israeli territory on Sunday. 520 rockets have landed in Israel since start of operation "pillar of defense". 280 rockets fired from Ghaza have been intercepted by "iron dome", an air defence system, in that time. Above: Launch of Hamas rocket. Arab League says it will send a delegation to the Ghaza strip on Tuesday while "Mideast Quartet" leader Tony Blair is to meet Israeli PM Netanyahu. Confrontations between Palestinian youngsters and Israeli occupation forces in the environment of Ofer military prison, west of Ramallah and south of Nablus. Editor's Note: The military prison of Ofer, a Jewish settlement in the West Bank, is notorious among Palestinian insurgents. There are accusations of human rights' abuse in that place. Above: Neighbours of Israel visiting "blueprint news" (i.e. activated visitor access points in the region for the last 200 registered visitors). Below: Visitor from one of the finest neighbourhoods in Washington DC. 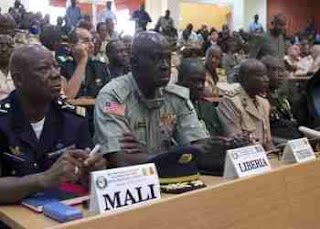 Mali welcomes the deployment of an international force to "sweep" Al-Qaeda from the north of the country. 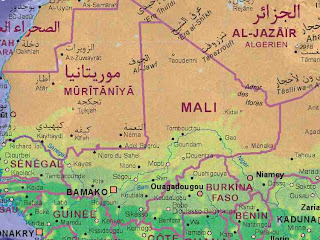 Bamako - On Monday [November 12], responsible [circles] in Mali welcome the decision of West African leaders to send 3.300 troops in order to [repulse] Islamic rebels from the north of the country. 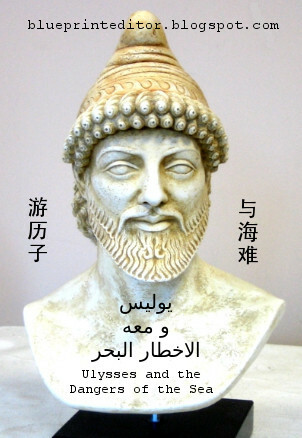 [That decision] is now awaiting [an approval] by the United Nations. 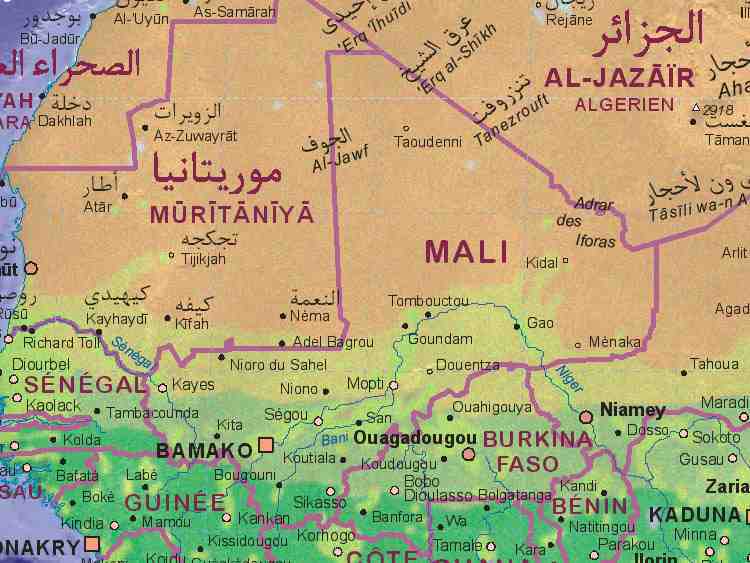 The defence minister of Mali, Colonel Yamousa Kamara, told the German Press Agency [i.e. DPA] that plannings [are under way] for the execution of an operation under African leadership in order to [repulse] the extremists "precisely [that time]". 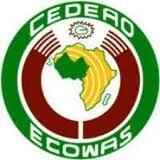 The African troops should comprise soldiers from 13-15 ECOWAS countries. The Economic Community Of West African States (ECOWAS) is a regional group of 15 countries, founded in 1975 in order to promote economic development in the region. Yesterday, November 11, national leaders decided during their meeting in Abuja, Nigeria, to sent troops to Mali. UPDATE of Iranian News on November 11/12 further down ! Iran acknowledges having targeted a U.S. plane over the [Persian] Gulf. The U.S. defence minister said the plane was occupied with a routine surveillance. 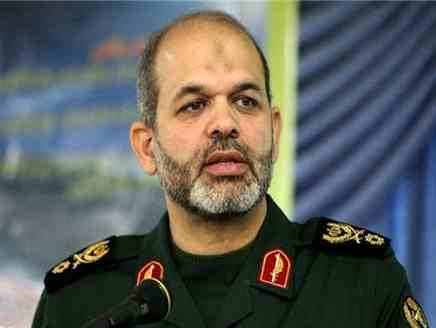 According to the Iranian defence minister Ahmed Wahidi [below image] this should have happened the week before. 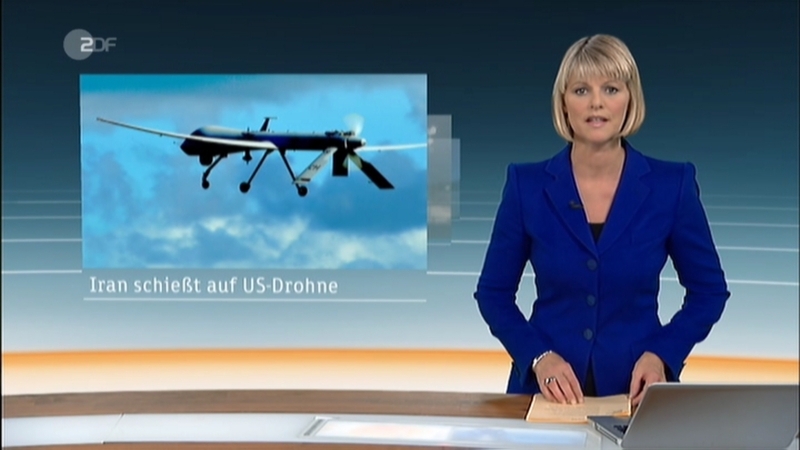 The night before his announcement, a German TV source already reported an "unmanned U.S. plane" [or drone] should have been chasen by two Iranian jet fighters without being damaged [above image]. Both reports are being considered to refer to the same incident. Headline: It's not so [with] Iran after economic sanctions ! America is using the weapon of economic sanctions as the instrument [of choice] among all instruments of foreign politics, [such] targeting the subjugation of the exposed nation and breaking its will. Washington demanding Iran to open an investigation on the circumstances of a reported death [case] in prison. On Friday [i.e. November 9], the U.S. secretary of foreign affairs demanded Iran to open an investigation on the circumstances of a reported Iranian death [case] in a prison. [After being] arrested at the end of October, [that person] died in prison according to [a news release] by "human rights organizations". Iran resumes a new round of negotiations with the International Atomic Energy Agency on December 13. The complete results of U.S. presidential elections being barely known, the world is back to business again. Due to different factors essential stock markets in the U.S.A., in Europe and Asia have gone down. As usual, U.S. commentators are putting the blame on difficulties in the Eurozone (Germany's economic slowdown, violent protest in Athens following the presentation of a 17 bn $ austerity plan, a high-ranking comment from Brussels). 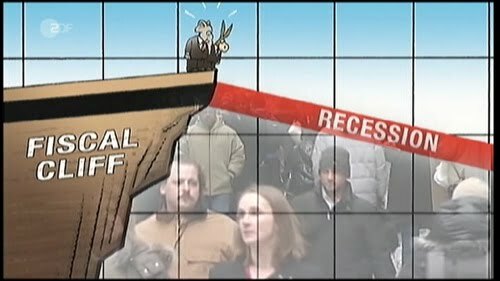 Yet, there are U.S. related problems as well: On top of it is the so-called "fiscal cliff" of 600 bn $ that has to be dealt with immediately by the old / new president who now needs to reach a bargain with his Republican opposition in the House of Representatives on "Capital Hill". Stagnation in the reduction of U.S. unemployment and the unwillingness of many tax payers to carry more are further items needed to be considered. - However, Obama finally got rid of "Monopoly Man" Mitt Romney which makes it much easier for him to do his job.